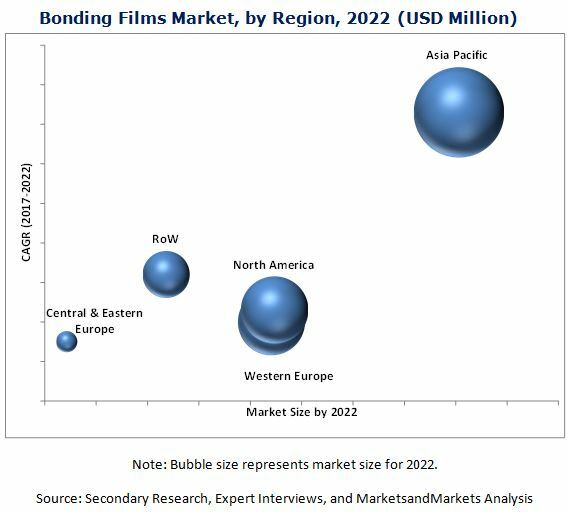 [142 Pages Report] Bonding Films Market was valued at USD 613.5 Million in 2016 and is projected to reach USD 985.5 Million by 2022, at a CAGR of 8.2% between 2017 and 2022. In this report, 2016 has been considered as the base year and the forecast period has been considered from 2017 to 2022. The bonding films value chain includes raw material manufacturers such as Nanya Plastics Corporation (Taiwan), 3M (US), Huntsman International LLC. (US), etc. that manufacture epoxy, acrylic, polyurethane, and other types of resins. These resins are used by manufacturers to develop various types of bonding films that are further used by various other companies such as Tokyo Electron Limited (Japan), Hexcel Corporation (US), etc. in various high-end applications. This report categorizes the bonding films market on the basis of type, technology, end-use industry, and region. The bonding films market was valued at USD 613.5 Million in 2016 and is projected to reach USD 985.5 Million by 2022, at a CAGR of 8.2% from 2017 to 2022. The increased demand for bonding films in the high-end applications of the electrical & electronics and transportation industries is expected to drive the growth of the bonding films market during the forecast period. The bonding films market has been classified on the basis of type into epoxy, acrylic, polyurethane, and others. Among types, the epoxy segment of the bonding films market is projected to grow at the highest CAGR during the forecast period. The growth of this segment of the market can be attributed to the high bonding strength of epoxy bonding films and their ability to bond with various types of substrates. Moreover, these bonding films offer high bond strength and controlled bond line thickness control. They are capable of being cured at various temperatures. On the basis of the end-use industry, the bonding films market has been classified into electrical & electronics, transportation, packaging, and others. The electrical & electronics end-use industry segment is projected to lead the bonding films market during the forecast period. The growth of this segment of the market can be attributed to the increasing use of bonding films in automotive, consumer, industrial, and defense & aerospace applications. The electrical & electronics end-use industry segment of the market for bonding films is projected to grow at the highest CAGR between 2017 and 2022. The Asia Pacific region is the largest market for bonding films across the globe. The Asia Pacific bonding films market is projected to grow at the highest CAGR between 2016 and 2022. The growth of the Asia Pacific bonding films can be attributed to the presence of various key manufacturers of bonding films in the region and increasing demand for bonding films from various end-use industries such as electrical & electronics and transportation of the countries such as China, South Korea, Japan, and Taiwan of the Asia Pacific region. 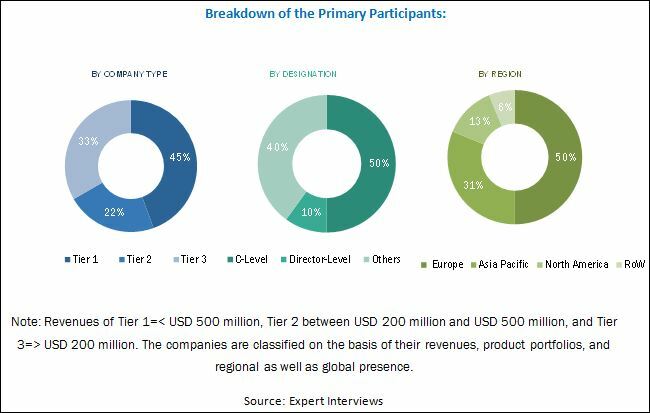 Moreover, the easy availability of raw materials in the Asia Pacific region has attracted several global companies and investors to set up their production facilities in the region, thereby fueling the growth of the Asia Pacific bonding films market. The major factors restraining the growth of the bonding films market across the globe are the high costs involved in the storage and transportation of bonding films, which make them preferable only for high-end applications in various industries as these applications demand high-quality bonding films at high costs. Some of the key players operating in the bonding films market are Henkel AG & Co. KGaA (Germany), 3M (US), Cytec Solvay Group (Belgium), Hitachi Chemical Co., Ltd. (Japan), Arkema S.A. (France), H.B. Fuller (US), Hexcel Corporation (US), Gurit (Switzerland), DuPont (US), and Rogers Corporation (US). The competition among these players is high, and they mostly compete with each other on the prices and quality of the products, their product portfolios, after sale services, customized solutions, etc. 11.4 Hitachi Chemical Co., Ltd.
*Details on Overview, Strength of Product Portfolio, Business Strategy Excellence, Products Offering, Recent Development’s, Business Strategy Might Not Be Captured in Case of Unlisted Companies. 12.6 Dai Nippon Printing Co., Ltd.
12.12 Nihon Matai Co., Ltd.
12.14 Specialty Adhesive Film Co, Inc. Figure 9 Asia-Pacific Dominated Bonding Films Market in 2016.